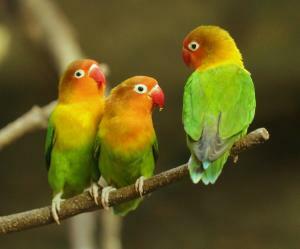 As most of us bird-lovers know, lovebirds are small parrots native to Africa. With their peach-coloured faces and vibrant green feathers, they are truly a sight to behold. But while they might be among the smallest parrots on the planet, they have the intelligence to match the biggest! It is unsurprising that so many people choose to keep them as pets, with their unique beauty and abundant brainpower. However, recently there has been talk about the health of wild species populations. The words ‘threatened’ and ‘endangered’ have been used, but is there any truth in it? Surely if lovebirds really were threatened, no one would be able to keep them as pets? The lovebird genus comprises nine different species, including the common Peach-faced, Masked and Fischer’s lovebird, which are found as pets in many UK homes, and the rarer Madagascar, Abyssinian, Red-faced, Nyasa Agapornis, Black-collared and Black-cheeked varieties. Surveys indicate that some of these, including the Nyasa and Black-cheeked lovebird (already classified as ’vulnerable’), might become endangered in the next decade if things continue as they are. But what is the reason for this? The biggest threat to the wild lovebird is habitat alteration and loss, including the gradual loss of water bodies, both through climate change and deliberate interference. Because the Black-cheeked lovebird mainly inhabits deciduous woodland where it has constant access to watering holes, the desiccation of these areas is causing many to die out. The irresponsible introduction of other species to concentrated areas of Black-cheeked i.e. the Nyasa, is also diminishing the gene pool and causing loss of the true species. In fact, most recent findings suggest that as few as 10,000 Black-cheeked lovebirds remain in the wild after facing heavy exploitation in the 1920s. While maintaining captive populations of purebred birds is hugely important to species survival, preserving them in the wild is the biggest priority. To a lesser extent, other species of lovebird including the Nyasa and Black-collared are suffering decline, although it is difficult to accurately quantify how many still exist. The Nyasa lovebird, also known as Lilian’s, is classified as ‘near threatened’ due to extensive habitat loss and exploitation in native Malawi, Mozambique, Zambia, Zimbabwe and Tanzania. Not only are these birds being legally and illegally captured for the trade in caged birds, but, just recently, Nyasa lovebirds have faced poisoning by careless poachers hunting larger mammals. Deliberate poisoning by farmers is also happening to some extent, as their cereal-eating ways has led to the persecution of many species of lovebird. So, what can be done to help protect wild lovebirds? Across the world, conservation efforts are underway to try and safeguard the future of wild lovebirds, although there are no guarantees they'll be successful. This includes efforts to manage hybridisation and retain species purity – something which is becoming a problem in the captive setting, as well as placing greater restrictions on trade. Creating suitable water sources is another priority, although changes in rainfall patterns are having a significant effect on how successful it is being. For now, managing the problem is a matter of 'waiting and seeing' and trying to reduce habitat destruction where possible. Educating people on how their actions are affecting wild lovebirds is also a step in the right direction, as many are unaware of the problem. As the greater part of us fledgling sweethearts know, lovebirds are little parrots local to Africa. With their peach-shaded appearances and energetic green plumes, they are really an incredible sight.